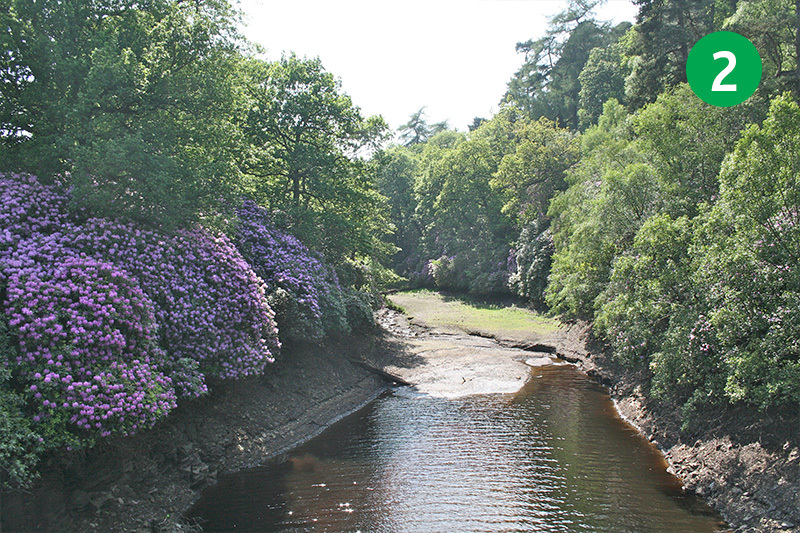 The video captured the rhododendrons which bloom so magnificently in June. But it’s a really enjoyable walk at any time of year. It starts from the bridge beside Errwood Hall car park. 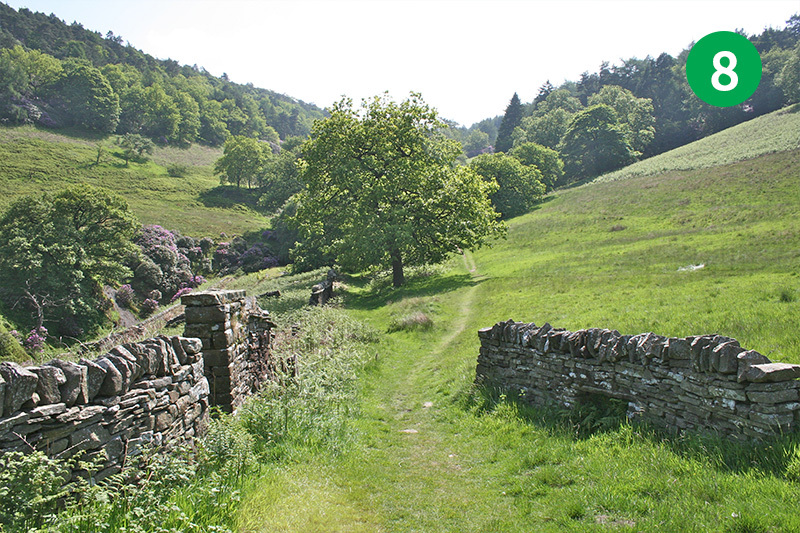 After passing the ruins of Errwood Hall, it heads up an old track alongside Shooter’s Clough Valley. There are some magnificent views all along the walk, especially from the top of the ridge. From here, it’s a short walk down the slope back to the car park. But it’s also easy to extend the walk by turning right at the top of the ridge, and then right again along a clearly marked path to Shining Tor, and perhaps even further to Pym Chair (see walk 8). 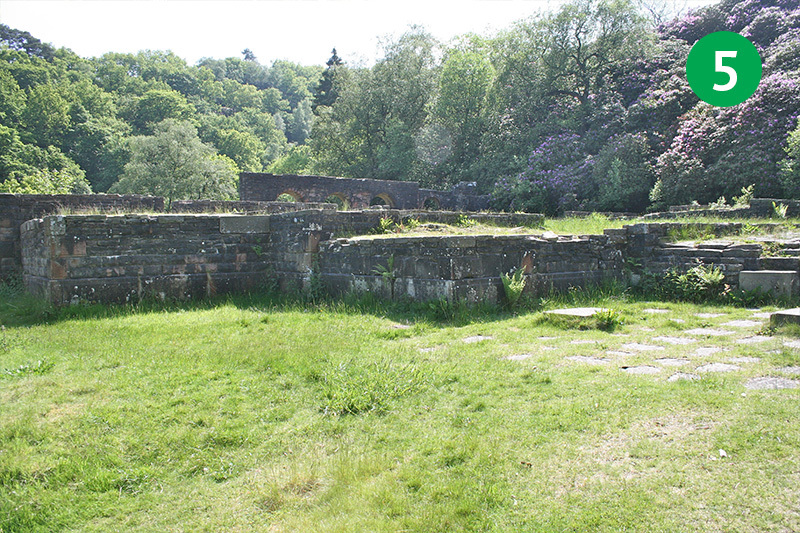 1: The walk starts at the modern bridge, just before Errwood Hall car park. 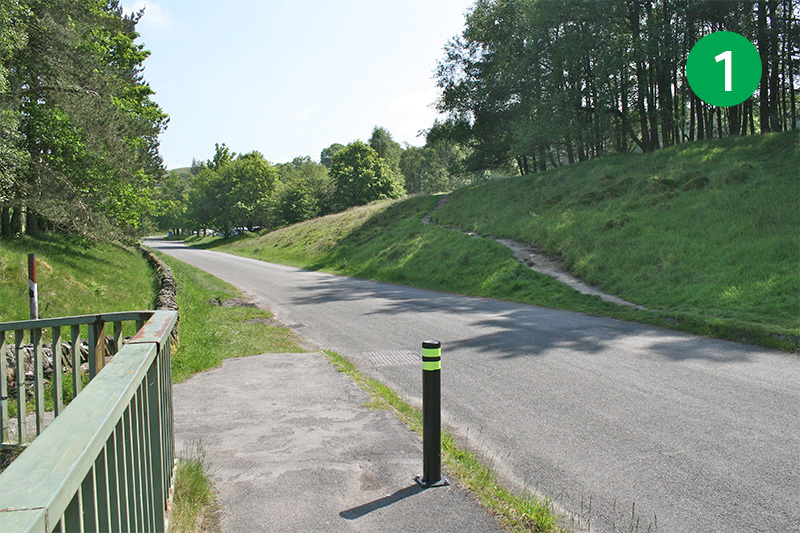 If the road to the car park is closed – which it is on bank holidays and Sundays between May and the end of September – park in the main car park just over the dam wall between the two reservoirs and walk down the road to reach the starting point. 2: The bridge was built during the construction of the reservoir in the mid 1960s. The stream flowing under it is Shooter’s Clough. 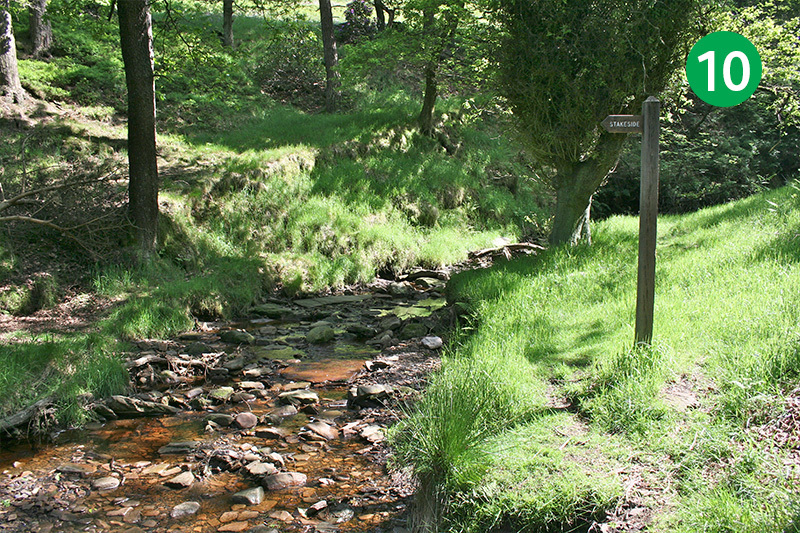 Before the valley was flooded, a small road ran beside the stream which connected the drowned hamlet of Goyt’s Bridge with Errwood Hall. 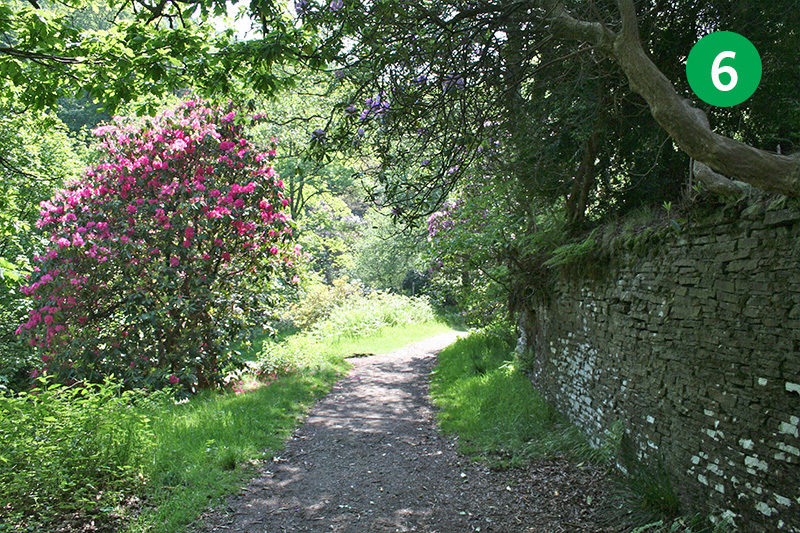 The Grimshawe family who lived in the hall planted the rhododendrons which flower so magnificently during late Spring and early Summer. 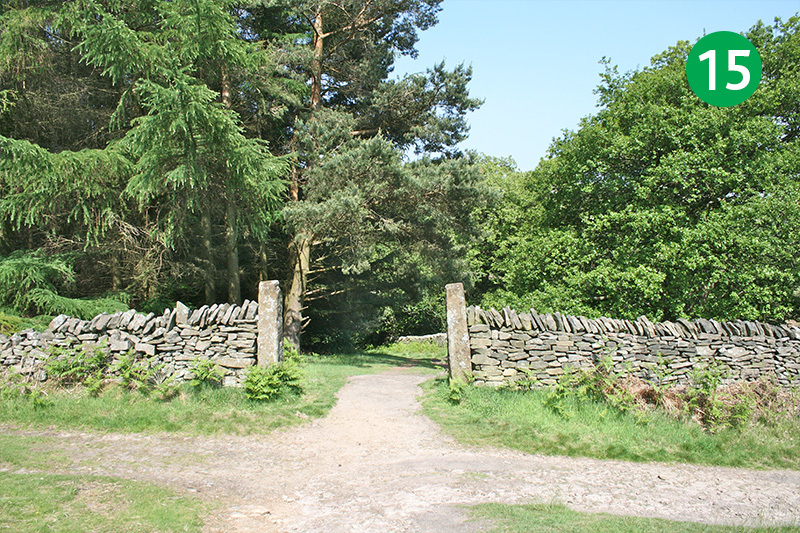 3: From the far end of the bridge, head diagonally up the slope to join the path from the car park, and go through a gap in the stone wall at the top. 4: Turn right and go down the track. As you get to the lowest part of the track, the stream runs underneath from one side to the other. It’s at this point that the old road from Goyt’s Bridge joined the track, going up to Errwood Hall. 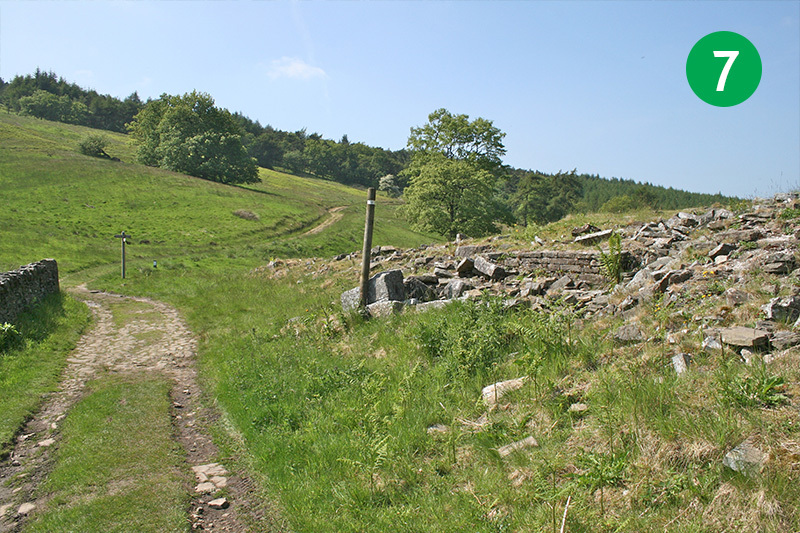 5: Continue up the slope and turn right, following the sign to the ruins of Errwood Hall. There’s lots of information on this website about the hall and the Grimshawe family who lived here (click to view). The seeds of the rhododendrons which surround the hall were brought as ballast in the family’s ocean-going yacht. 6. After exploring the ruins, turn back the way you came and turn right at the footpath sign. Hidden in the valley on the left are the remains of Castedge coal mine. Click here for information on the mine. 7. At the end of the path are the ruins of Castedge Farmhouse. And high on the hill behind lie the graves of the Grimshawe family. 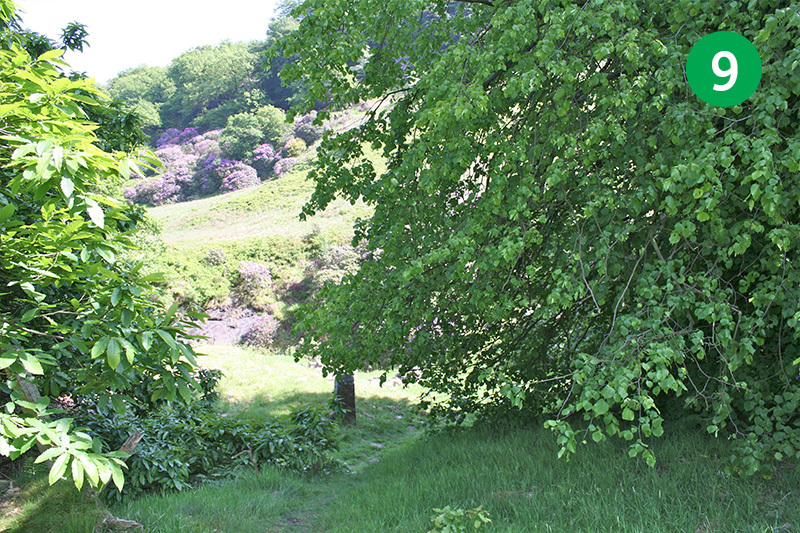 To view the graveyard, head up the path which winds up the left hand side of slope. 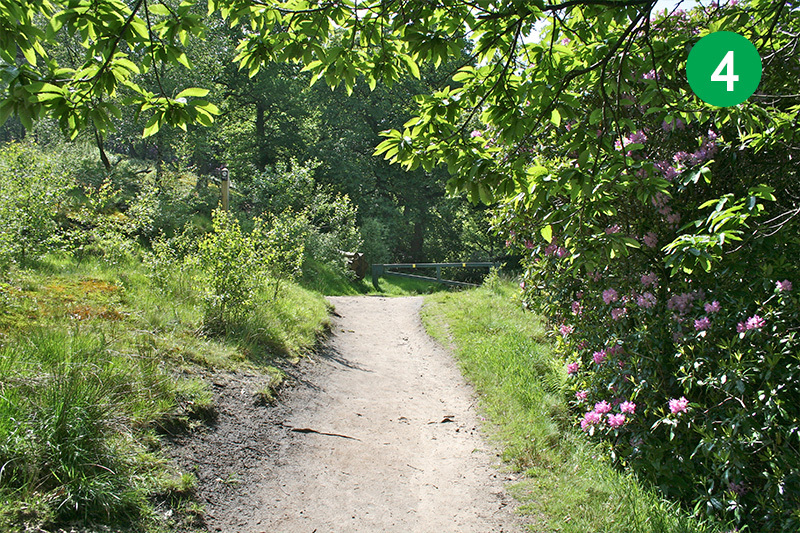 8: To continue the walk, go down the path opposite the ruins. The walls on your left once surrounded vegetable gardens which provided produce to the hall. In the wall on the right is a fresh-water spring. And a flat area on the slope to the right is all that remains of a tennis court. 9: A short distance further on the left are the remains of Shooter’s Clough Cottage. 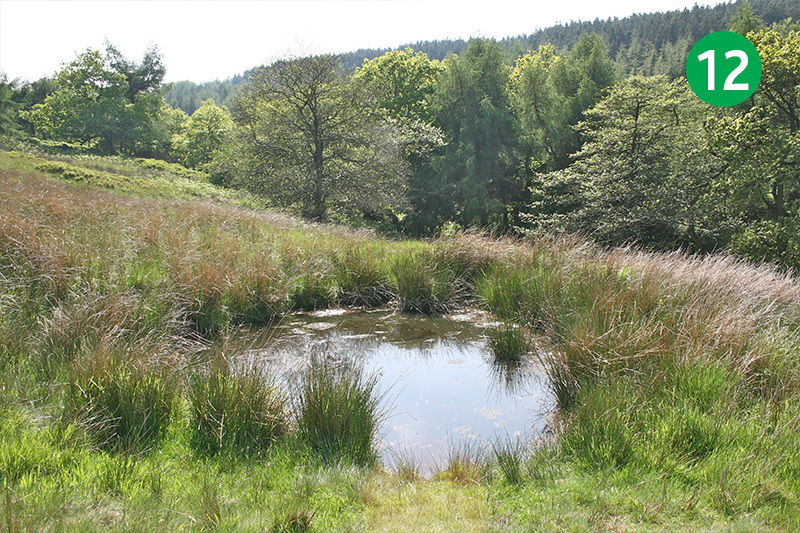 This idyllic spot was once home to the manager of Castedge coal mine and his family. 10: Keep going along this narrow track, ignoring some stone steps on the left, and walk up the gradual slope until you reach a footpath sign at the end of the path. 11. Follow the footpath sign to the left, going over the stream and head up the slope as it winds around to the right. This was once the main route from the valley to reach the Buxton to Macclesfield road, and on to the famous Cat & Fiddle pub. 12: As the path turns sharply to the left, look out for a small pond on your right. This was a ventilation shaft for the coal mine, and shows how extensive the workings were. 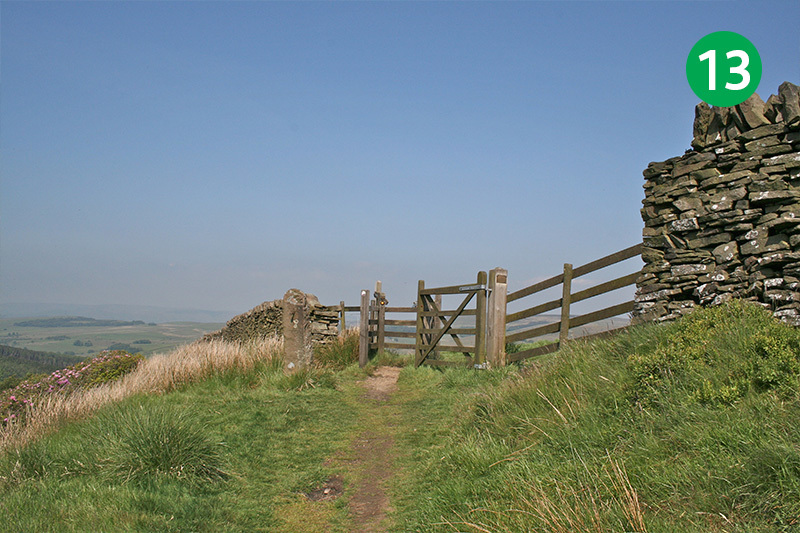 From here, follow the track up the slope between two stone gateposts. 13: Exit the path through a small gate. The path to your right leads all the way to the Macclesfield road. 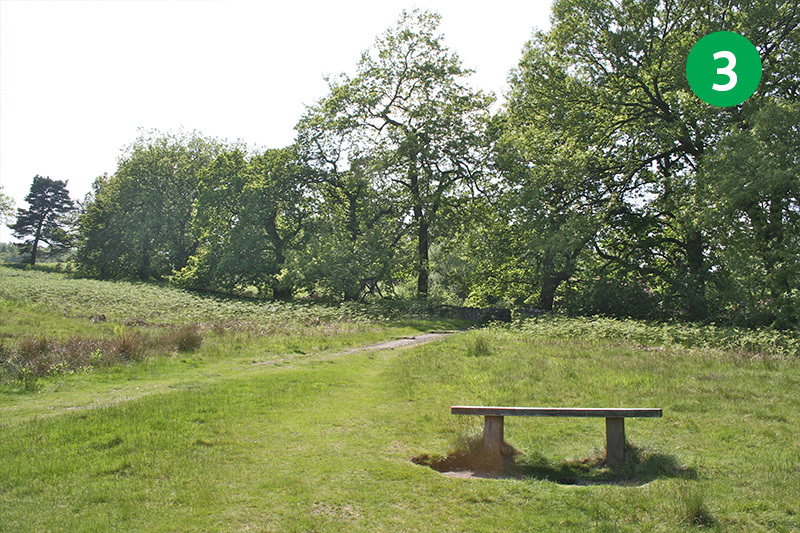 But you can also turn right along here to visit Shining Tor, and even Pym Chair (see walk 8). But to continue this walk, turn left down the hillside, following the obvious path across the moorland. 14. You will soon see Errwood Reservoir in the distance. 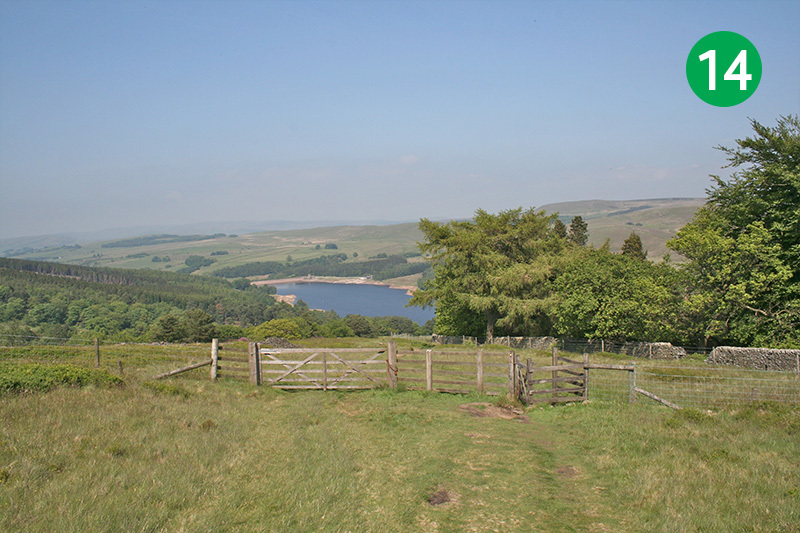 The reservoir was completed in 1968, some 30 years after Fernilee Reservoir to the north. 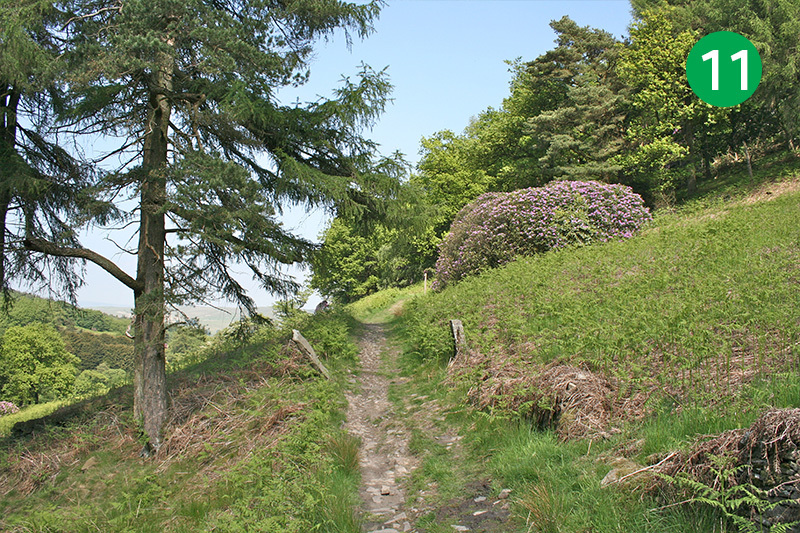 The winding path on the far hillside is Old Goyt Lane, and was once the main route into Goyt’s Bridge from Buxton (see walk 10). 15: At the end of this footpath you have another choice of routes. 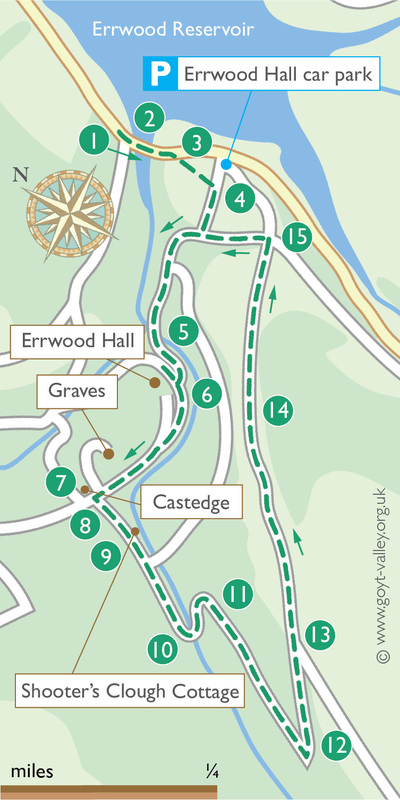 You could turn right towards towards the riverside footpath and the packhorse bridge (see walk 5), or straight ahead towards Errwood Hall car park. But I prefer to turn left, and then right, through the gap in the stone wall, and back down the slope to return to the starting point.